Buy this Hair Color 3 in 1 (Natural Brown) at RM 63.70 (20% off retail) when you become a member of NewLife International. Newlife Organic 3 in 1 Herbal Hair Color is made up of specially tested essential ingredients of 7 top quality organic rare herbs. It is a pure, natural product and does not contain lead, mercury, phenylenediamine, toluene diamine, or their derivatives, nor any other chemicals whatsoever. Unlike chemical hair dye methods which penetrate the hair shaft by opening the hair cuticle to lighten and deposit the desired color, Newlife Organic 3 in 1 Herbal Hair Color coats the outside of each follicle of hair with a protective layer of herbs that conditions the hair and gives a natural, lively, attractive, and lasting coppery brownish shade to the gray hair. The herbal color coating adds volume and reflects light so that each hair gains in strength, volume, and shine — not only color. It is an excellent hair conditioner. It is a natural highlighter to your hair. It makes hair very soft and healthy, while giving it a natural shine. Its application gives body and texture hair. It dispels heat and has a soothing effect. It is harmless to the body system and causes no irritation to the skin. See label inside for directions to use. Includes a pair of latex gloves. Approximately 6 applications for medium length hair. Colour, Highlighter & Conditioner, All-in-One! Get lustrous hair that is also healthy. No more worries about harmful chemicals that can expose you to health risks. Now with NewLife™ Organic 3-in-1 Herbal Hair Color, you have a hair color product that beautifies and protects your crown. 100% organic, natural, rare herbs that protect hair. 100% organic, natural, rare herbs that protect hair. Does not contain synthetic colours, preservatives, and chemicals. 100% Non-toxic – no lead, mercury, Phenylenediamine/Toluenediamine or its derivatives. Does not contain chemicals that experts believe could cause allergic reactions, cancer or even death. Gives hair a youthful appearance and gorgeous colour without health risks. Coats the outside of each hair shaft with a protective layer of herbs that conditions the hair and gives a natural and lively vitality. A natural alternative that is effective and economical. Functions as colour, highlighter, and conditioner, all in one application. Leaves a natural, permanent, lively, attractive coppery brownish shade when applied to grey hair while giving a natural shine to black hair. Leaves hair soft and healthy with a natural shine. Gives body and texture to hair. Harmless to the body and causes no irritation to skin. You eat natural foods, wear natural fibres, and wash your hair with natural shampoo. You celebrate everything organic, non-toxic, sustainable, and seasonal. And now you want to colour your hair! You grab a box of hair dye from the pharmacy. You cringe when you read the chemical concoctions in the list on the hair dye box. Now you worry that your artificially enhanced hair dye may literally be the death of you, causing at the worst cancer, or at best, serious allergies. If you are an expectant mother you scan the studies for information about whether colouring your hair during pregnancy may harm your baby. You stress so much over your tresses, you create even more grey hairs to be cosmetically covered. What should you do? 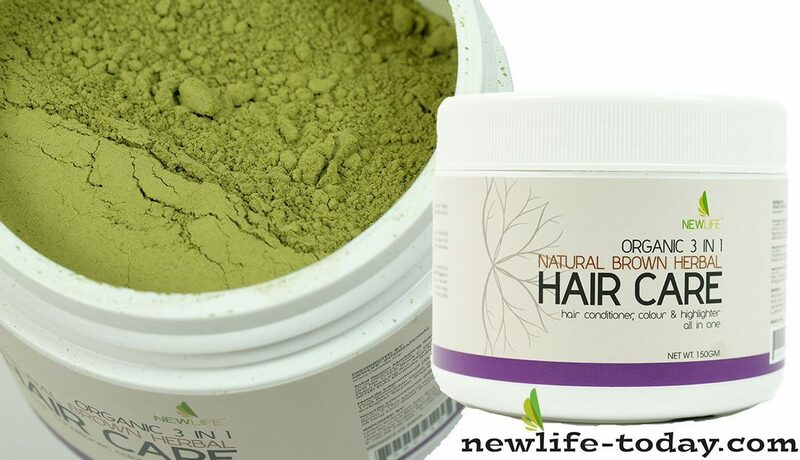 Here is help: NewLife™ Organic 3 in 1 Herbal Hair Color – 100% safe. No more bad hair days! A study published in 2001 in the international Journal of Cancer found that hair dyes when used at least once a month had twice the risk of bladder cancer compared to nonusers. Most recently, doctors reported in the BMJ (formerly British Medical Journal) that allergic reactions to hair dyes had increased substantially. Uses bleaching agent to penetrate each strand and then change the colour from the inside out. Remains in your hair until it grows out. Ammonia : Dehydrating and drying. Can irritate your skin and really damage your hair. p-Penylenediamine(PPD) : Causes allergies – scaly, crusty skin and/or red bumps. Hair dye that touches the scalp can be absorbed into the skin and then into the bloodstream. If you’re pregnant, the dye-spiked blood can penetrate the placenta and travel into your baby’s bloodstream, this is especially critical during the first three months of pregnancy when the baby’s internal organs and limbs are being formed. Made up of specially tested essential ingredients of eleven top quality organic rare herbs. 100% pure natural product. Contains no lead, mercury, phenylenediamine. toluenediamine. or their derivatives, nor.any other chemicals whatsoever. Gives body, volume and reflects light, so that each hair gains in strength, volume, and shine – not only colour. Natural highlighter to your hair. Makes hair very soft and healthy, while giving it a natural shine. Dispels heat and has a soothing effect. Safe to the body system and causes no irritation to skin.